Logitech used to make the best cheap gaming mouse in the business. The Logitech MX518 was the under $100 dream machine everyone recommended to new gamers. Whether you spent twelve hours a day in World of Warcraft or were constantly fragging infants in Counterstrike, the MX518 was a workhorse mouse with the best sensor available and just enough extra buttons to let you get stuff done. The G403 includes a single weight if you really feel the need to make adjustments. The new Logitech G403 Prodigy mouse (in both a wired and wireless version) is out to reclaim the MX518's glory by being the mesh of excellent tech and simple design that made the now 11-year-old MX518 such a champ. No plethora of customization options that lead you down a rabbit hole of adjustments. Just a solid damn mouse. It’s not the only part of Logitech’s new G Prodigy lineup to embrace a specific blend of gamer-friendly features and low key sensibility. The new G213 keyboard (with rubber dome spill-proof keys), and G231 headset (with washable mesh ear cups), are also about being gamer-friendly without getting as crazy as the gear traditionally geared toward gamers. 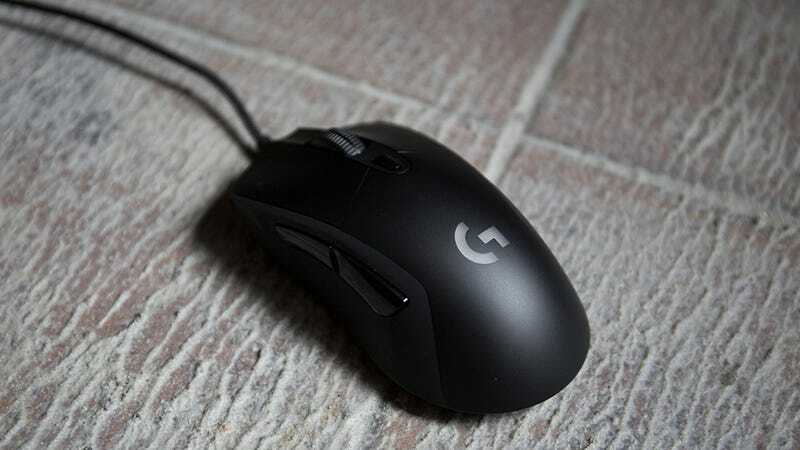 And the G403 appears to be a really nice one. “I don’t hate it,” an Apple Mouse-loving Gizmodo colleague said. She’d been wary after watching me fiddle with it. Then she put it in her own hand and was immediately surprised. The G403 just fits any hand nicely, and the 6 buttons are relatively easy to program. Same for the G213 keyboard. Both it and the G403 uses Logitech’s gaming software. Which besides letting you program the buttons, also lets you customize the LEDs under the keys and scroll wheel. Logitech promises 16.8 million colors—a common claim from gaming peripheral manufacturers, but like all the others that claim to give you a multitude of colors, the Logitech G Prodigy series falls a little short. Yellows in particular came off as more green than yellow. All four devices will be available starting today and retail at $70, except for the wireless G403 mouse, which will retail for $100.